This one's an illustration of the nature of thought, and the Internet-aided human brain's (or in this case, a Human Brain's) capacity to form most unlikely linkages. 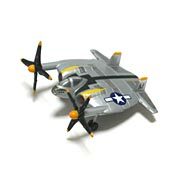 While leaving a comment over at Rocket Jones, in thanks for providing the link to the intriguing little translator described below, I got to thinking about the name "F5U". Being a sometime military historian, this looked a lot like an obsolete US naval Fighter designation. F for fighter (as in F-4 Phantom), 5 as in "the fifth type of this particular aircraft (fighter etc) from that manufacturer", and U for Chance-Vought, an aircraft manufacturer. (This really odd system in described elsewhere in some detail.) A simplified version is still in use, and was adopted by the whole of the US Military in 1962. Before then, the US Army Air Force (and later US Air Force) used a similar version, ignoring the manufacturer. They'd got up to numbers over 100, as in "F-111" by 1962. The US Navy F-4 Phantom was (briefly) known in USAF service as the F-110, before the USAF decided to do things the Navy's way, and call it the F-4. That's why you have aircraft today called the "F-15", F-18" and so on, while in WW2 you had the "P-51 Mustang" (P for Pursuit, the old designation for Fighter). As you can see, the "F-111" designation shows the age of that particular design project : it pre-dates 1962. I googled on "F5U" and got nothing but links to a particular type of computer chip. Then I remembered that the old US Navy designation for "Fighter" was "P" for Pursuit. And P's close enough to F, especially when trying to find the equivalent Roman Alphabet letter for the Japanese character "AR". A Google on "P5U" got me a link to one of the quirkier aircraft ever built, the P5U "Flying Flapjack". Ah, Perfect! So I immediately wrote about that in the comment, I was sure it would be appreciated. The initial site with data from FAS didn't include a picture. Now I knew from an old Webster's Encyclopedia Yearbook we acquired (it came with the house we first bought in Australia, formerly owned by a US Journalist), that you really have to see this aircraft to believe it. So I Googled again, this time for an image. And soon found one, on a Japanese site, which fitted the whole tenor of the subject rather well. But the Japanese site looked so interesting, that I had a traipse around it. And amongst other interesting things, I found this, which can only be described as "Yamato Sashimi". 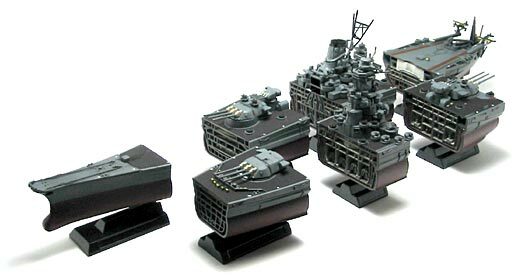 The Yamato, by the way, is infamous amongst naval military historians as being the largest battleship ever built. SF fans may know it better through the "Star Blazers" animated series, featuring a re-floated version transformed into a Space (Battle)Ship. (The series is not long on hard science, as you can guess). It will be a long time before can make an artificial intelligence that can do something like the above. Consider the different sources if information involved, the tenuous links between them. It's as weird and as wonderful as... Yamato Sashimi. Would have been better to split it down the keel for the interior view. Wanted to build a model of my own U.S. Navy ship done that way.